Yesterday was a friend’s birthday (Happy birthday Jess!) 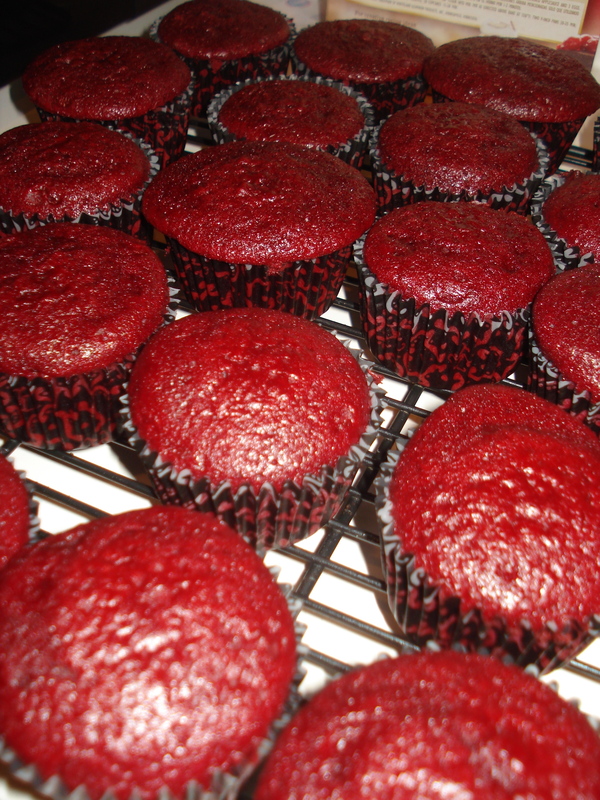 and the day before she had hinted at wanting some red velvet cupcakes… ask and you shall receive!! I love using recipes from the Cake Mix Doctor because they’re so quick, easy, and always delicious. I typically like to make all my cakes from scratch, but every once in while when I’m in a hurry I’ll use one of her recipes. She always starts by using pre-made cake mix (like the kind you buy in a box from the grocery store). But instead of following the directions on the back of the box, you follow her directions. 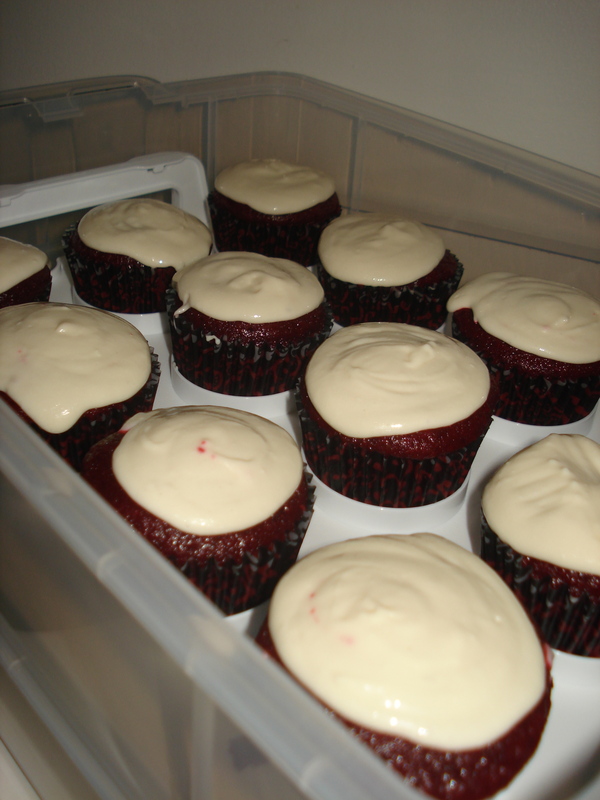 I didn’t really make any changes to her red velvet cupcake recipe, but I did use a different cream cheese frosting recipe that I’ve used in the past. I promise these are easy to make, even if you’re not a baker! It’s a pretty straight forward recipe. Place a rack in the center of the oven and preheat the oven to 350° F. Line cupcake cups with paper liners. Set the pans aside. 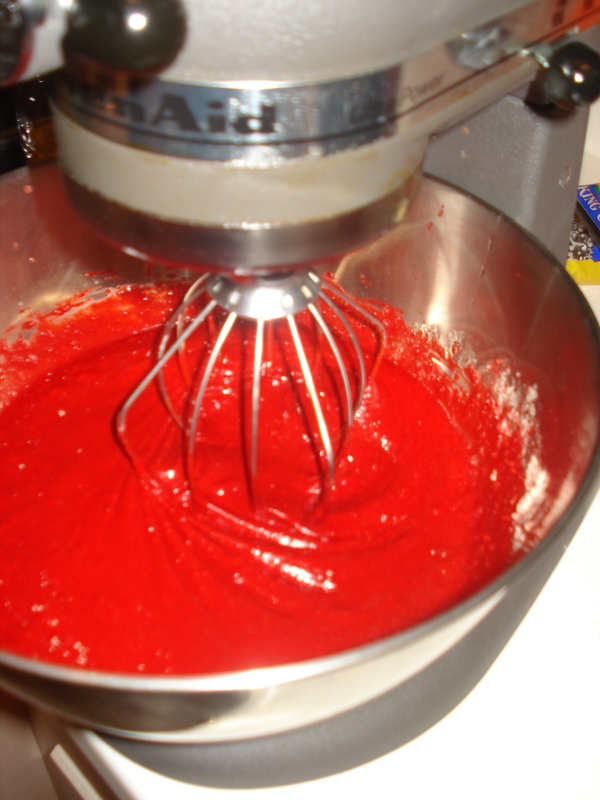 Place the cake mix, pudding mix, sour cream, water, oil, food coloring, and eggs in a large mixing bowl. Blend with an electric mixer (or in kitchen aid mixer) on low speed for 30 seconds. Stop the machine and scrape down the sides of the bowl with a rubber spatula. Increase the mixer speed to medium and beat 2 minutes more, scraping down the sides again if needed. The batter should look thick and well combined. Spoon or scoop 1/3 cup batter into each lined cupcake cup, filling it three quarters of the way full. (You should get between 22 and 24 cupcakes…I got 18) Place the pan in the oven. Bake the cupcakes until they spring back when lightly pressed with your finger, 18 to 20 minutes. Remove the pans from the oven and place them on wire racks to cool for 5 minutes. Take cupcakes out of pan and allow to completely cool before icing. If you’re in a hurry you can always put them in the fridge to cool down quicker. Now it’s time to make your frosting! * You can choose to use full-fat ingredients if you like! If you’re looking for a stiffer icing, I would use full-fat cream cheese and butter instead. You’re icing will be a little runnier if you stick to reduced fat ingredients…but you will be saving yourself many calories!! In a medium bowl, cream together the cream cheese and butter until creamy. Mix in the vanilla, then gradually stir in the confectioners’ sugar. Store in the refrigerator to thicken, if too runny. This frosting doesn’t turn out overwhelmingly sweet. It’s basically in your control…just add more or less confectioner’s sugar depending on how you like your icing! These look phenomenal! Thanks for the shout-out love!